Just ANOTHER mid century dresser! I can't help myself...when I see one, I just gotta have it!!! A mid century bedroom set...Fashion Trend by Johnson Carper. 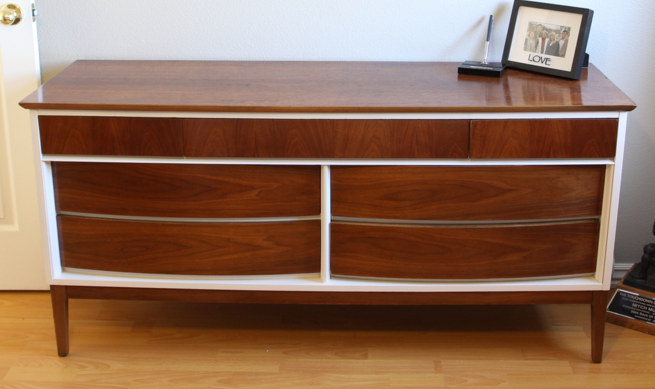 I couldn't find a maker's mark anywhere on the set so I googled "mid century dresser" and found a picture of one like it! I ended up having to buy the entire set at an auction...dresser, chest of drawers and full size bed frame. I sold the chest to off set the cost of the dresser...which is the piece I really wanted! I have a full size bed in Mitchell's room so I might use the bed frame in there. I decided not to strip and oil the drawers...they really are in excellent condition....I wiped them down with Restor-a-finish just to clean and brighten a bit. I painted the "box" (KSTP...high gloss white) only because the top was laminate... I did that with Matt's dresser and I love how it turned out! But then I got to thinking...why would I hide a beautiful piece like this in a guest room? So I took the dresser out of my room and put it in the guest room and put the new one in my room! The only other thing I have added to my "proper" guest room is this little rattan table (bought two and sold one) and the magazine rack from the living room. Again, you will not find AFFORDABLE new furniture that is built as well and with woods like walnut, teak, rosewood and mahogany! There is a reason vintage and antique furniture have managed to survive decades of use! When I walk around my house and look at some of the beautiful vintage pieces I have collected I am amazed at just how little I have paid for them. Keep in mind MOST were in much need of a little care and attention but if you are willing to roll up your sleeves and do the work, you can create a home filled with beautiful pieces too! That is why I have this blog...to show you just how easy it can be!!! Stop drooling and start doing!! !